The region of Lunigiana, in northern Tuscany, is a land of ancient castles, chestnut-wooded hillsides and tumbling rivers, protected by a ring of mountains—the Appenines to the north, and the Apuan Alps to the south. It is a place where timeless country traditions and seasonal farming cycles still govern the pace of life, and the region remains mostly untouched by our modern age. Here you will experience the tranquility and peace of the countryside, with only the sound of church bells to break the silence. "We can’t begin to thank you both enough for the incredible week we’ve spent here away from it all. Everything has been absolutely perfect. Your creativity and warmth emanate from every corner of this lovely place." A view of the village showing the villa and terraces leading to the swimming pool; Casa della Quercia is the three-story villa to the right of the cypress tree. 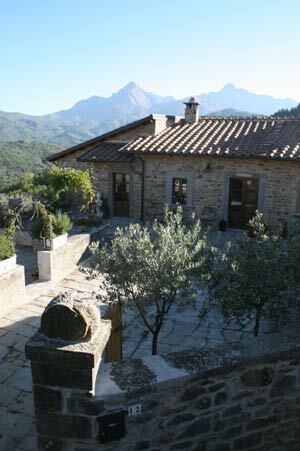 Casa della Quercia is a three-story Grade A listed historic villa dating from the 1500s, but with earlier (Roman) foundations. The villa is spacious and comfortable and was designed as the owners' second home, not a rental property, with renovations and furnishings of the highest quality. 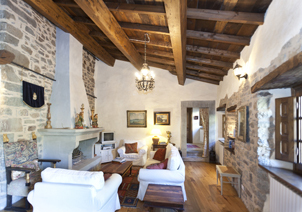 The villa has five bedrooms/bathrooms, with an adjacent converted barn adding a sixth bedroom, accommodating up to twelve guests in all. In traditional Tuscan style, the two main floors of the villa are connected by an outdoor staircase, creating two separate living quarters, perfect for two families or groups of friends who wish to share the villa. Smaller groups may rent the villa in May and September as a private two-bedroom villa. The terraced gardens and stone courtyards provide many enchanting areas to enjoy morning breakfast or lunch al aperto, evening cocktails by the pool, or a barbecue under the vine-covered arbor. 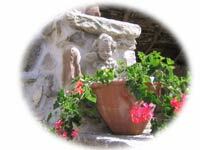 There are many sunbathing areas and shady nooks for quiet contemplation on the various levels and terraces. 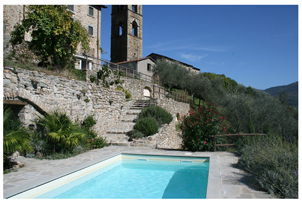 The pool is accessed by two flights of steps that wind through the olive grove and terraces planted with lavender and rosemary. Beyond the pool terrace is a meadow and a chestnut wood with a stream running through it, delightful for kids to explore, and old mule paths that lead up to alpine meadows and down to nearby villages for those who are more adventurous. The villa has spectacular views across chestnut-wooded valleys and hillsides to the mountain peaks of the Apuan Alps National Park. 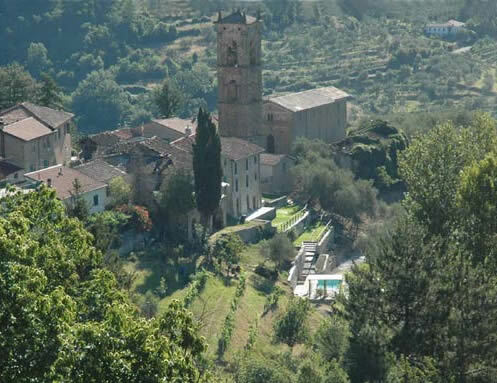 It is located 50 miles north of Lucca, and is just a 50 minute drive from the coastal villages and famed seafood restaurants of the Italian Riviera and the Cinque Terre. A luxurious six-bedroom villa with hillside terraces and private pool situated on the edge of a small village, offering privacy without a sense of isolation.